Rabbi David Lau rejects PA Chairman’s claim that Israeli rabbis called to poison Palestinian water. 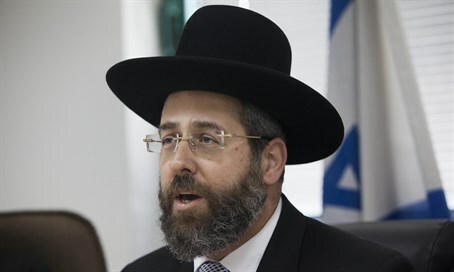 Ashkenazi Chief Rabbi of Israel Rabbi David Lau on Thursday condemned Palestinian Authority (PA) Chairman Mahmoud Abbas’ speech to the European Parliament, in which he claimed that Israeli rabbis called to poison Palestinian water. “The Israeli Rabbinate and the thousands of rabbis serving the cities of Israel, from all ethnic groups and circles, love peace and pursue peace. This is our way of life, we are guided by the Torah of Israel, the Torah of life,” said Rabbi Lau. “Israeli rabbis see the supreme value of human life; we believe in the concept 'love every individual created in the image of God,’” he said. He appealed to leaders of the PA to reject the inciting and false claims and noted that the religious leaders of all parties are committed to increase peace around the world. Rabbi Lau’s comments come after the European Jewish Congress and Prime Minister Binyamin Netanyahu’s office condemned Abbas’ speech as well.